Los autores de este libro, con isbn 978-84-8323-520-1, son Jeff Stranks y Herbert Puchta, esta publicación tiene ciento veintiocho páginas. Esta obra la edita Cambridge University Press. Su andadura comenzó a finales de los años noventa y actualmente se encuentra en Madrid. Tiene en su haber más de 100 publicaciones en catalogo. La editorial está especializada en Libros De Texto De Inglés. El fondo editorial de Cambridge University Press se distribuye en colecciones como Gramática, Diccionarios y Lecturas Graduadas. Rebecca Cassidy, Peter Lamont, Paul Edmondson, Charles Tripp y Stanley Wells son algunos de los escritores que han publicado en esta editorial. Otros libros de Puchta, Herbert son English In Mind For Spanish Speakers 3. 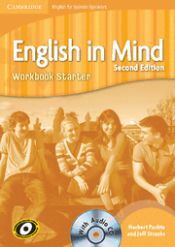 Student's Book, English In Mind For Spanish Speakers Level 3 Workbook With Audio Cd 2nd Edition, Inteligencias Multiples, Quick Minds, Level 1 : Wordcards, Quick Minds, Level 2 : Class Audio Cds, Quick Minds, Level 5 : Posters, Quick Minds, Level1 : Class Audio Cds y Quick Minds, Level 3 : Class Audio Cds. .
Otros libros de Stranks, Jeff son English In Mind 4: Student's Book, English In Mind For Spanish Speakers Level 4 Workbook With Audio Cd 2nd Edition, English In Mind For Spanish Speakers Level 5 Student's Book With Dvd-rom 2nd Edition, English In Mind For Spanish Speakers Level 5 Workbook With Audio Cd 2nd Edition, Citizen Z A2 Student's Book With Augmented Reality, Citizen Z B1 Student's Book With Augmented Reality, Citizen Z B2 Video Dvd y Citizen Z B2 Class Audio Cds (4). .